"Discover the mystery behind the legend." 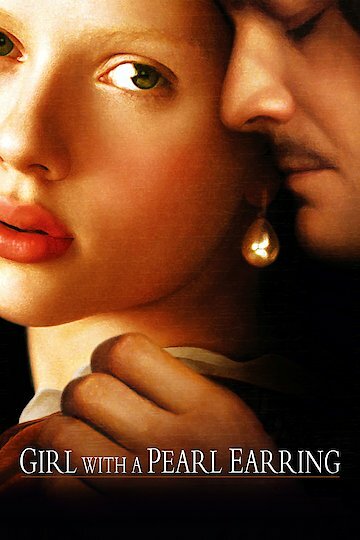 The Girl with a Pearl Earring is a historical fiction film based on a famous work of art by Johannes Vermeer. Vermeer's painting "The Girl with a Pearl Earring" is widely recognized, but the subject of the painting has not been identified. This film is a speculation on the events that led to the creation of the painting. The young woman Griet has just relocated from her home in the country to be a housemaid to the Vermeers. Griet is unaccustomed to the city and her low status. She does not have much power in the household, but is discovered by Vermeer as she cleans his workroom. The painter Vermeer is known to be quiet and somewhat reclusive, but he is drawn to the similarly quiet Griet. She becomes his assistant and poses for him. She is forced to do so in secret because Vermeer's pregnant wife, Catharina, is jealous, and it would cause a scandal for an unmarried young woman to be spending so much time with a married man. Pieter Van Ruijven is Vermeer's greatest benefactor and patron, and he commissions a portrait of Griet. Van Ruijven's goal is to have not only a painting of Griet but Griet herself. Griet, meanwhile, is navigating the complex social structure of the household and trying to keep her involvement with Vermeer out of the path rumor and gossip. She is also developing a romance with a local peasant boy. Scarlett Johansson starred as the servant girl Griet. Colin Firth played the painter Johannes Vermeer. His wife was played by Essie Smith. Tom Wilkinson was Vermeer's wealthy patron, Pieter Van Ruijven. The story was based on a fiction novel by Tracy Chevalier, also titled "The Girl with a Pearl Earring". The film was directed by Peter Webber, and the movie was released in 2004. Girl with a Pearl Earring is currently available to watch free on The Roku Channel, YouTube and stream, download, buy on demand at Amazon, Vudu, Google Play, FandangoNow, iTunes, YouTube VOD online.